Jim Messina cried a bit when he was announced as Deputy Chief of Staff in the Obama White House. When Dont Ask Dont Tell was repealed by a US Senate vote, Jim Messina of Montana cried a little more. Prior to working in the White House Jim Messina was chief of staff for US Senator Max Baucus the Democrat from Montana who arrests Medical Doctors who have opposing views to Obamacare. The national health care which might spark civil unrest if imposed on the American people in 2014 has been deemed unconstitutional in the US Justice System. A woman named Melodee Haynes was shagging US Senator Baucus, 15 years his junior and acted as State Chief of Staff in Montana for Max Baucus. Ms. Hanes is now Mrs. Baucus. In a spring 2009 Democrat diner which Jim Messina attended, he explained to the KPAX-8 CBS affiliate in Missoula Montana that Max Baucus "...was like a father to me." Well if Max was like a father to Jim Messina, then Melodee was like a mother to Jim Messina....all in the Political Montana family. 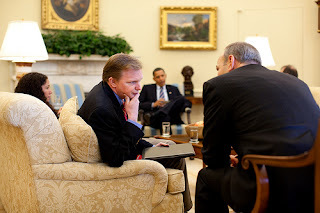 Amongst other things, President Obama brought the Montana Ideology, and Jim Messina as staff into the White House. The Montana ideology does not include Constitutional Rights, as will be shown in our letter to 44 linked below. Jim Messina was integral in stopping civil rights requests from the first African American president from Montana. 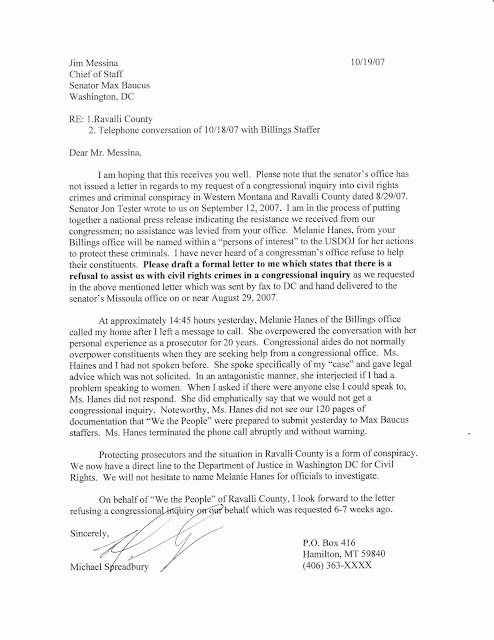 In the fall of 2007 I got a call from Melodee Hanes explaining that a request for a congressional inquiry into civil rights in the State of Montana. At that time Jim Messina was Baucus's chief of staff over Melodee Hanes. Melodee was a complete hissy; totally unprofessional on the phone to a constituent. 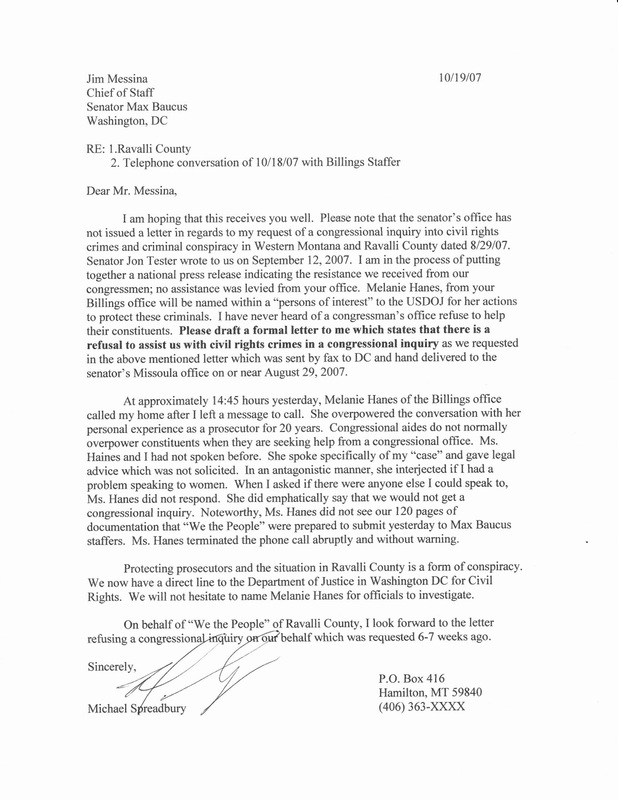 It all made sense; Melodee Hanes was emotionally attached to Max Baucus and took it personally that a civil rights request was made of her Beau: Max Baucus. Due to the telephone misconduct, I inquired as to the superior of Melodee Haynes: it was revealed as Jim Messina. 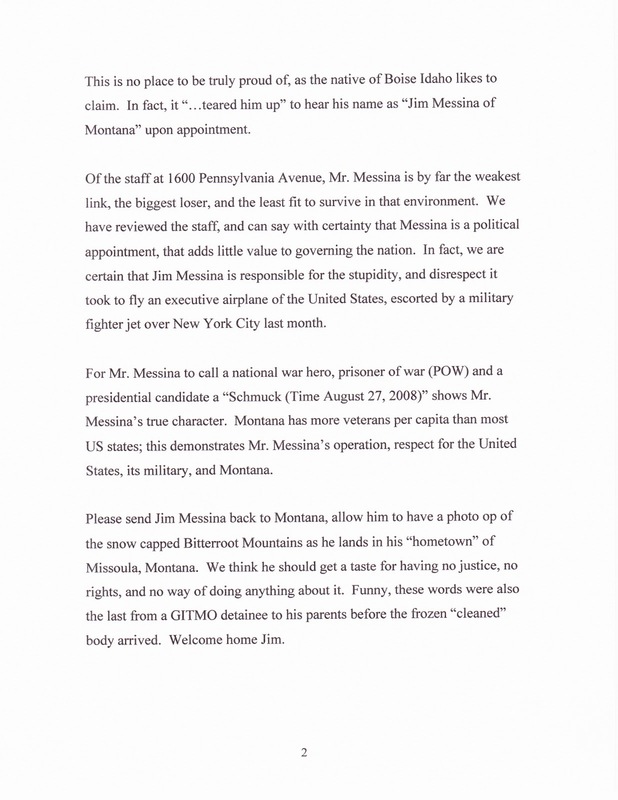 So I write a letter to Jim Messina in Washington, DC. Since Jim Messina has no other experience in any profession other than politics since college, he was too important for a lowly constituent. Little did I know he was tapped for work in the White House as 'The biggest loser' to have worked there. UPDATE: Melodee Hanes became Mrs. Max Baucus and we found out that she fled prosecution of false "murders" as her former husband was the Iowa Chief Medical examiner, and Melodee the prosecutor of suspicious deaths of infants deemed homicide by Melodee's former beau. The parents were indicted for murder in a scam. Now Melodee is Administrative counsel for the US Justice Department and "fast and furious" Eric Holder. Criminals love company in Washington DC! THE MONTANA US PRESIDENT LETTER--MILLION OF VIEWERS; ABOUT CIVIL RIGHTS. This Jim Messina Political Show includes a cover up of a crime by a law student by the American Bar: Jimmy orchestrated the US Presidential appointment of Dean Edwin Eck to the IRS in 2008 to cover up felony crime in Montana. Well, We the (ordinary) People of Montana, other than writing the US President letter that millions have read also made a Website called Bitterroot Rising, and a documentary called "Beneath the Beauty". Wouldn't you know that George Corn would demand a court order that the material get removed from the Internet. In 238 glorious pages, we describe this terrorism on the American people. WHY WAS THE ORIGINAL SITE, THEN AN ARCHIVE SITE SHUT DOWN..............? 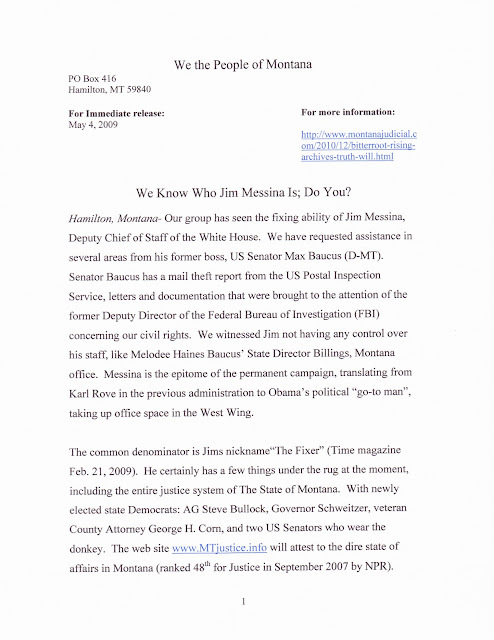 We call Montana without rights "Montanistan"--something Jim Messina protects and cries about. Here is the press release where we describe Montana for what it is: a place without rights, which gladly accepts Federal dollars from the US Treasury, but does not recognize the US Constitution. How do political patsy's get in power of our government? In an attempt to be rehired by a federal agency Jim Messina as Deputy Chief of Staff can eliminate any federal worker without cause. Jim Messina has not ever saluted anyone, yet is more powerful than career military. The State of Montana has one of the highest rate of enlistment, yet Jim Messina calls lifelong career military "Schmucks". Jim MessinaBaucus. This message is independent of politics...JimMessina is dangerous to the American way, no matter which way you vote in the booth. At the very beginning of the Obama campaign as it entered the White House, do we really know that Jim Messina didn't order that Executive Airplane over New York? Jim Messina had the worst education, and the worst preparation of White House Staff for Obama. Jim Messina proved permanent politics of the permanent campaign is more important than statesmanship, or scholorship. As the vetting process began for cabinet positions, Jim Messina showed his true colors: these candidates did not pay their taxes, and that criteria did not get caught by Jim Messina. Nobody canned Jim Messina due to incompetence because he was in charge in the White House. Do Americans trust Jim Messina as the permanent campaign that never stopped politicking? How bold to tell the American people that $1Billion dollars are needed to elect an unpopular candidate. It only proves that Jim Messina can spin any situation, and convince an under-educated populace that the first African American President who ignored a request for civil rights should be reelected in 2012 [see the Montana US President letter from 2009]. If Jim Messina can convince you with words like making "2008 look prehistoric" keep your buzz into politics, America is in more trouble than I thought. Jim Messina was too important for the people, and instead of striving for statesmanship and stewardship of the American way, kept politics first. Why should Jim Messina's personal issue of gays in the military be a policy when it only affected 13, 000 soldiers? If we decline all standards, we let losers like Jim Messina rob America of its ideals, and tell us what to think via expensive Television ads; we are sunk as once a great country. The University of Montana tower in Missoula MT is in the background. The Jim Messina political show was brought to you by the $1B campaign--but remember the Democrats want you to think big money is something they don't want. Lawyers call this a proxy argument: say they really dont like corporate money, but ask for more than any other campaign. How did America become so stupid to allow people like Karl Rove and Jim Messina to run our country? Its the Jim Messina Political show. ...and the $1.7M given by US Senator Max Baucus to the law school. JIM MESSINA IS ON THE ALUMNI BOARD AT THIS SCHOOL. Thanks for reading about Jim Messina from Montana, running Obama's 2012 re-election bid. They counted on a quiet press from Montana, due to Lee Enterprises monopoly in our state. Lee Enterprises made sure to make Jim Messina look like a Missoula hero, instead of the crook that he is to get his agenda across. Thanks to your hundreds of views to this blog, Mr. Messina has been neutralized. After re-electing a president, he is not a cabinet member, but being paid from a politics fund....for now. The criminal leaks associated with him, and the felony crime coverup for Wetzsteon in Montana USA did him in. I think the American people enjoy the reprive from Gay Crazy too. You re forgotten Jim. The people behind this blog wish Jim Messina well on his speaking tour. The White House misses your confidential leaks, and sub-standard work. Was Angela Wetzsteon worth your career Mr. Messina? You have a long time to answer that question as it is doubtful any administration will tap you again.